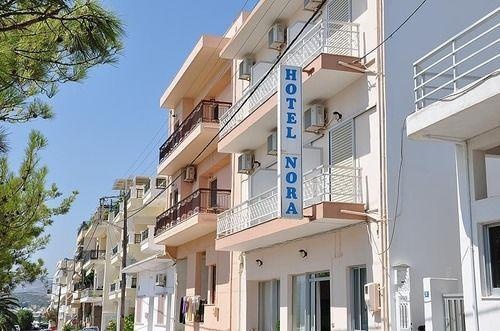 When you stay at Nora Hotel in Sitia, you'll be near the beach and within the vicinity of Toplou Monastery. This hotel is within the region of Richtis Gorge and Vai Palm Grove. Make yourself at home in one of the 8 air-conditioned rooms featuring refrigerators. Have private balconies. Complimentary wireless Internet access is available to keep you connected. Private bathrooms with showers feature complimentary toiletries and hair dryers. Amenities Make use of convenient amenities, which include complimentary wireless Internet access and a television in a common area. Take advantage of the hotel's room service (during limited hours). Quiet neighbourhood. Next to the sea. Close to town. Cheap place to stay. Excellent value for money. Good value for money. No curtains. Fantastic view. No shower curtain. Quiet neighbourhood. Silent neighbourhood. Comfortable bed.